The referendum ballots begun to be printed. The process takes place at Poligrafic factory from the Capital. The CEC representatives monitor the process. Over two million ballots out of six million necessary will be printed here. The rest of them will be printed at two other topographies from the country. The referendum asks the citizens two reply at two questions that will be printed on two different ballots. On the yellow ballot, the citizens will be asked either they agree to reduce the number of deputies from 101 to 61. 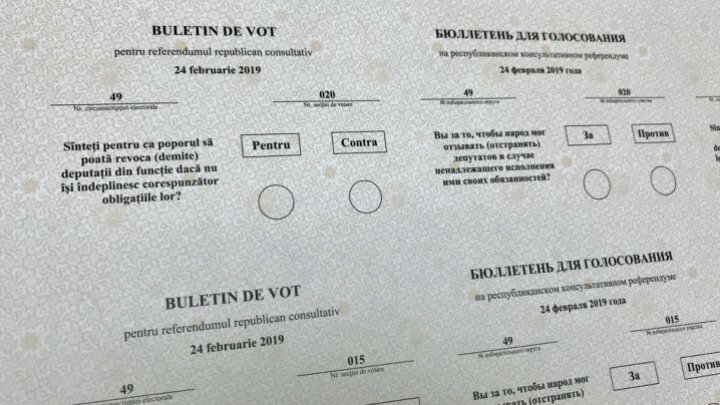 The second, beige ballot will ask the Moldovans whether they agree to dismiss the deputies who don't fulfill their promises. "All the procedures are transparent. The representative of the press will have access to monitor the process", said Alina Russu, CEC president. The ballots for the parliamentary elections will be printed starting Tuesday. According to CEC, one ballot costs 13 bani.